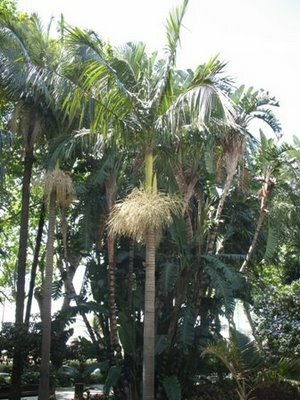 My favorite palm in my garden is archontophoenix-alexandrae, known as Alexandra Palm or Alexander Palm. It has such a nice form to it with long feather shaped fronds and a nice smooth trunk. This palm is rated for zones 10B through 11, so it shouldn't do well here in zone 9A, but it's done remarkably well, other than a bit of leaf damage in our cold winters. It might just be a fluke, because I had 2 others of the same type that didn't make it. This palm originated in Australia. It grows on a single trunk to a height of 40 feet. Growth rate is moderate. It has low salt tolerance. It has no major pest problems, but larger nursery specimens don't transplant easily because of potential damage to the crown.